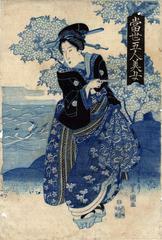 There is another aizuri-e bijin print in the Lyon Collection by Toyokuni II (see related links). That woman's kimono is decorated with bats and gourds. This woman's robes are decorated with the backs of turtles, fungus (mushrooms?) and the rear views of antlered deer among large leaves - probably maple.The Chazen Museum owns another aizuri-e from this group. There appears to be another series of prints by Toyokuni II using this same series title, but pairs beautiful women with inset pictures of famous actors. There is one such example in the collection of Tokyo Metropolitan Library.